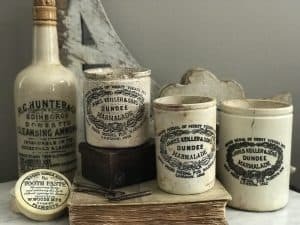 This is a listing for one (1) Keiller 1# Chubby Marmalade Pot circa 1879. 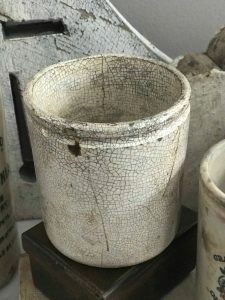 This tattered pot has a few chips, including one to the front of the top lip, overall crazing and various hairline cracks. These blemishes only add to its beauty and distinguish it as one of a kind. These charming pots vary slightly in shape and size as they were each handmade. 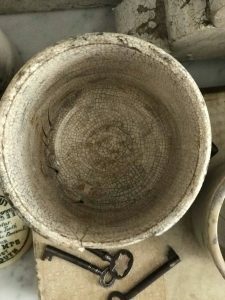 Pot may contain crazing, spots of discoloration, hairline cracks and minor chips and fleabites that only add to its character and do not detract from its display value. 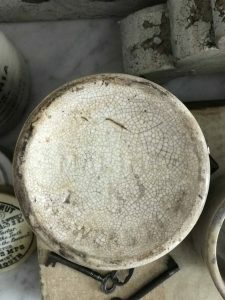 These are expected due to age, use and being buried for decades and then being dug up and rescued.